Few coaches have done more with less than Scott Satterfield. Few coaches have done more with less than Scott Satterfield. That bodes well in both the short and long term for a Louisville program in equal need of an immediate injection of winning, or just excitement -- really anything other than the steady dose of whatever that was in 2018 -- and extended stability. In the direct aftermath of Jeff Brohm declining to return to Louisville, the overwhelming reaction to the program setting its sights on Satterfield seemed to range from skepticism to disappointment. However, almost anyone would have likely been met with a similar reception, simply given the excitement around the possibility of Brohm’s homecoming. First off, as good a job as Brohm has done at Purdue, it may be better for both sides that he opted not to return. An ex-Louisville player, Brohm would be granted the sort of leeway that most new coaches are not. That could come to fruition in any number of ways, from increased fan support to, perhaps, more time than would be granted to someone without program ties. That extra patience can be the difference in consistency needed to establish a winning infrastructure, especially in the win-now landscape of modern college football. On the flip side, though, if Brohm had proven not to be the guy, things could have gotten a bit awkward. No one wants to have to fire a program great, and if the divorce had gotten messy it would reflect poorly on everyone involved. Plus, even if Brohm one day is “the guy”, the time and place aren’t always right. In some senses “the guy before the guy” can be just as important as “the guy”. Now that’s not to say that Scott Satterfield can’t take Louisville where it wants to ultimately end up, but he probably has more of a rebuild on his hands than the Cardinal brass wants to admit. Whether he reaches the promised land or not, simply returning the team to national prominence, raising the profile of the program, and establishing some modicum of consistent contendership, even just within the division, would constitute a successful tenure. That being said, it will take time. Brohm would have been granted the requisite opportunity to prove whether or not he was the man for the job. Deserved or not, it would behoove Louisville to extend the same courtesy to Satterfield. In fairness, and in true college football fan fashion, the Card faithful appear to be talking themselves into their new head coach. Granted, just as the initial disappointment was inevitable, the same probably would have happened for nearly any other worthwhile candidate. However, Satterfield is not a tough sell. The primary concerns with his appointment seem to be his recruiting prowess or perceived lack thereof and having won against lesser competition. Sure, his class rankings at Appalachian State are less than awe inspiring, but recruiting at App State is different than recruiting at Louisville. The same could be said about recruiting at any two different schools in the sport. Every program has a ceiling and floor when it comes to talent acquisition. It’s tough to evaluate the ceiling at Satterfield’s former school given that it has been a part of the FBS since just 2014. Meanwhile, while Louisville isn’t in the same tier of attractiveness as Clemson or any of the other perennial powers, Clemson themselves weren’t always in that tier. The most tried and true avenue to climbing from one tier to the next is winning. Satterfield wins. In fact, he’s won at least nine games every season since 2015, one of only five coaches that hold that distinction, and his Mountaineers are 7th in the FBS in winning percentage over that stretch. And though he is earning the better part of those victories against the Sun Belt, he’s doing so with Sun Belt talent. Talent evaluation and, more importantly, the subsequent development of said talent are two of his particular strong suits. According to the 247Sports Talent Composite, his team ranked in the bottom half of the Sun Belt this season, probably to some degree on account of the bulk of their leadership corps having committed to a then-FCS program. Overall, the team was 110th in the talent composite, yet, entering championship weekend, ranked 17th in S&P+, 35th in FEI, and 22nd in F+, the combined ranking of the two opponent adjusted measures. Comparatively, Louisville, apparently with the 39th most talented team in the country, finished their season 109th in S&P+, second to last at 129th in FEI, and 122nd in F+. Only four G5 programs have ranked in the top ten of F+, among non-Power Five teams, in each of the last four seasons: Boise State, Memphis, San Diego State, and Appalachian State. On paper, especially early on, Louisville may not have the personnel of a Clemson, but the disparity between that matchup and the disparity between, say, App State and Arkansas State is not dissimilar. That didn’t stop Satterfield from beating the Red Wolves head-to-head 35-9, en route to winning the inaugural Sun Belt Championship Game. Even outside conference play, Satterfield’s Mountaineers played a Penn State team that ranked 13th in overall talent, just a handful of spots below Clemson, to within a score in Happy Valley. For context, if this Louisville team, which is ostensibly far more talented than App State, played Penn State on a neutral field right now, the Cardinals would be about 29 point underdogs. More starkly indicative of both Satterfield’s ability, as well as how far Louisville has fallen, if App State played the Cards on a neutral field right now, the Mountaineers would be favored by S&P+ by about 28 or 29, too. Louisville, as a program, is in a state of flux. Satterfield, during his career, orchestrated arguably the most impressive FCS to FBS transition ever, establishing unassailable consistency in a college football landscape that by and large lacks it. Louisville’s upside under Satterfield is yet to be seen, but its floor just got a lot higher, which, in turn, simultaneously raises its ceiling, whatever that may be. 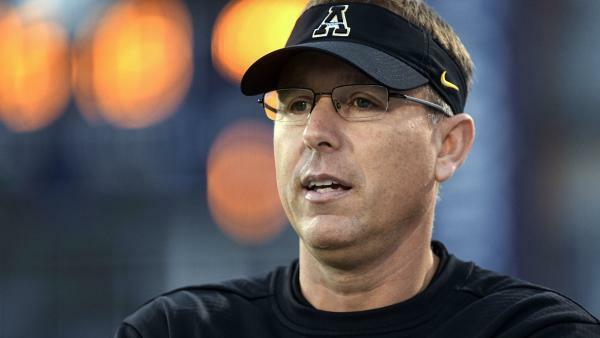 Whether he’s “the guy” or “the guy before the guy”, Scott Satterfield brings to the table what U of L has most glaringly lacked in recent memory: stability. For the time being, that alone should be more than enough.